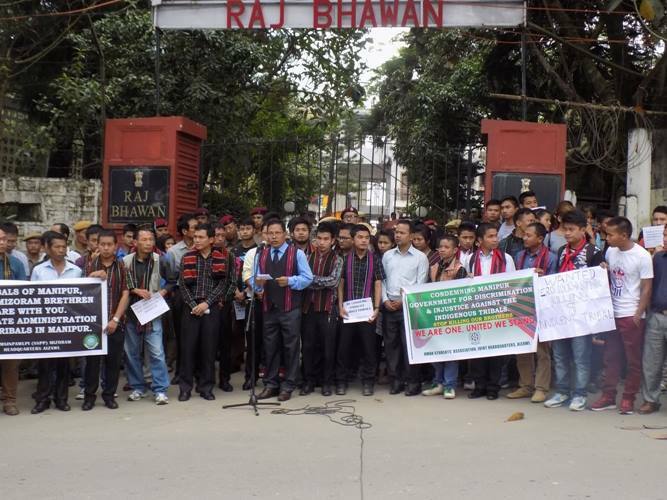 Aizawl, Sep 10 : Mizo, Zomi, Hmar and Thado-Kuki students assembled in front of the Raj Bhawan in Aizawl to express solidarity with Manipur tribals and demanded a separate administration for the community. “We… are seriously concerned with the situation of Manipur … as we are culturally one and same with people living in the hill areas who may be commonly addressed as Zo ethnic tribes though they are often called by different names,” said the memorandum signed by leaders of the Mizo Students’ Union, Siamsinpawlpi, Hmar Students’ Association and Thado-Kuki Students’ Union. Meanwhile, rights-group Amnesty International (India) called upon the Manipur government for “prompt, full and independent investigations into all allegations of human rights abuses related to protests in the state in the past few months, including the excessive use of police force”. “Authorities in Manipur must demonstrate their commitment to human rights and the rule of law. “Excessive police force cannot be an answer to violent protests. The police must distinguish between persons engaging in violence and peaceful demonstrators or bystanders. Firearms should be used only as a last resort when less extreme means have failed, and intentional lethal force should be used only when strictly unavoidable to protect life,” Patel was quoted as saying by a statement issued on the group’s website.